It's quite likely that at some point or the other, while trudging up what seems like a million steps, we've wondered—why couldn't someone just replace the stairway with a slide? After all, we just need to get from Point A to Point B, and hey, aren't slides just that much cooler? While chances are that these sacrilegious thoughts are immediately dismissed, not everyone is willing to do so. Today, we explore a family home in Nakameguro that was designed by Tokyo-based Kazuki Nakamura and Kenichi Izuhara of Level Architects and you guessed it—has an indoor slide! The floors in this three-storey house are all connected by slides on one side and a flight of stairs on the other; you walk up for that bit of exercise, but you just swoosh your way down when you want to take it easy, or just have a bit of fun. While it's a no-brainer that it's a child's dream come true, you can bet your life's savings that the parents have a ton of fun here too! While the facade is decidedly abstract, it is definitely not a harbinger for the things to come. In fact, looking at this, you're not quite sure of what to expect. Simple, white, minimalist—that's all there seemingly is. Note that there are very few windows here. That's because the interiors are lit through vertical openings in the roof, plus a central courtyard (yep, that's in there too) allows for plenty of natural sunlight to enter the living room. The four corners of the house are rounded, in order to accommodate both the stairs and the slide which cover the circumference. Going down—or up, in this case—the rabbit hole? 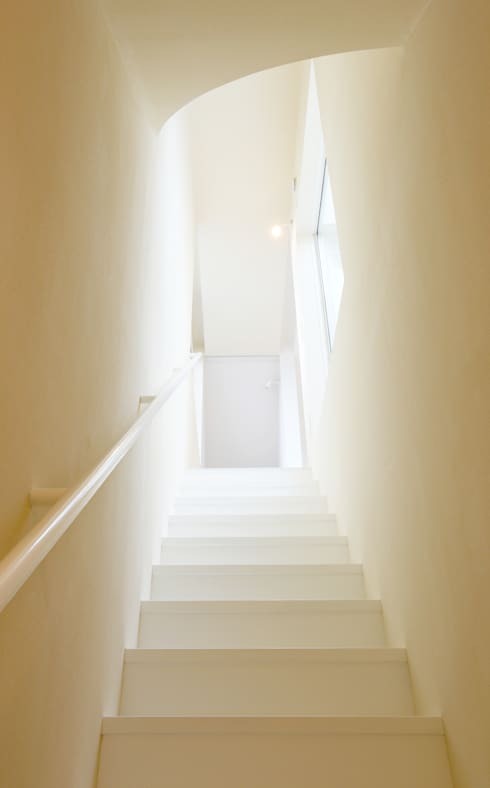 To create an almost surreal feel, the architects applied a single colour tone to everything in this area—the stairs, the ceiling, the wall and even the hand rail. 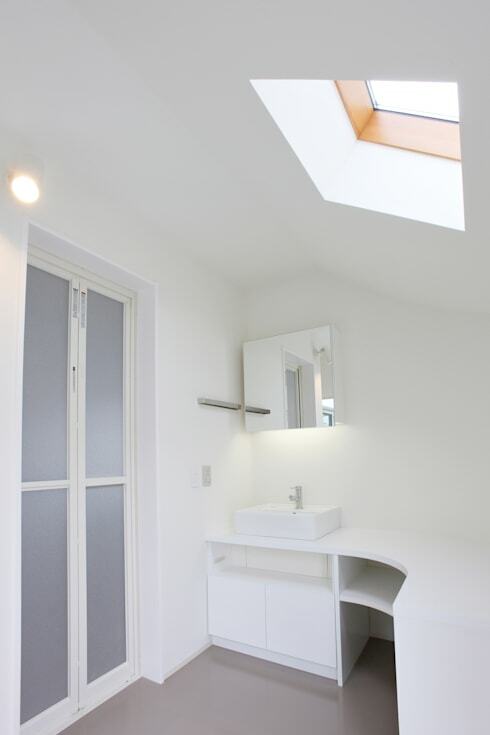 In a smaller, more compact area such as this, the single colour minus any distractions creates a soothing effect. 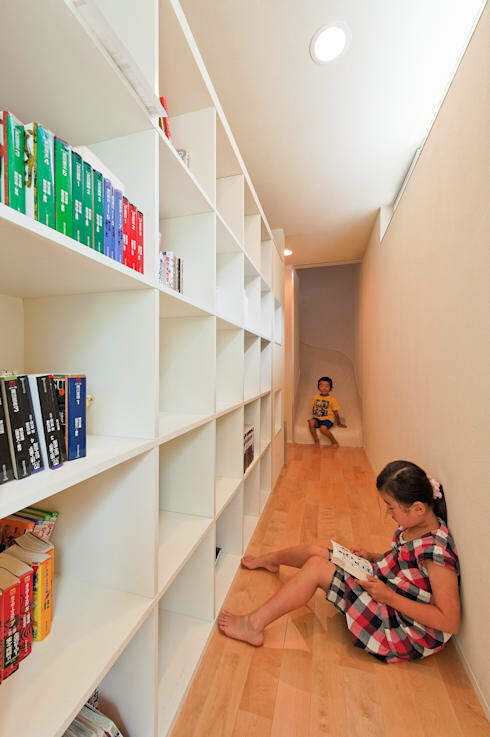 While the stairs take up the corridor pace on one side of the house, the slide doubles up as a corridor on another side, and acts as a gateway to the rooms in the house—the library, the children's study room, play room and so on. Lucky kids. Parents who can't get their kids to hunker down and study, take note—just build in a slide or two that will motivate the little 'uns to at least make their way to the books. If that looks unlikely, perhaps you can get some ideas about what to do with a narrow passageway or corridor! Stacked shelves like these that can act as a great storage provider in cramped spaces such as these, which would otherwise be entirely wasted. TV time? Oh, just wrap up your homework and glide right down to the living room! Here, one of our favourite spaces in the entire home, the vibe and ambience is almost retro. A flat-screen television encased in a shallow alcove with a brown background recalls to mind the idiot boxes of the 60s while the dark wood flooring and the ball lighting further add to that 'groovy' vibe. You might think it's an anomaly in a place such as this, but it's so carefully thought out that it fits right in. Also, notice the sliding doors on the left—it leads into a small play area for the children while being a great source for natural sunlight. Sure, it can't get more minimalist than this but you can't deny that this still leaves an impression. 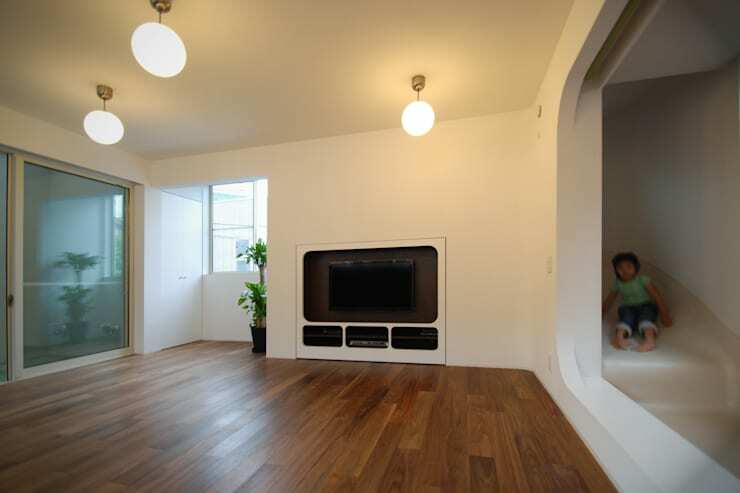 Once again, a single colour tone—white—is maintained, which ties together the whole space as a unit. Here you can see the curved outline of the house, which has been incorporated into the design via the custom-made cabinetry. There's also enough storage space here so that there's no room for clutter—a running theme in this crazy house. If you want to keep ogling at homes with unusual interiors, check out An intriguingly plush Asian home. 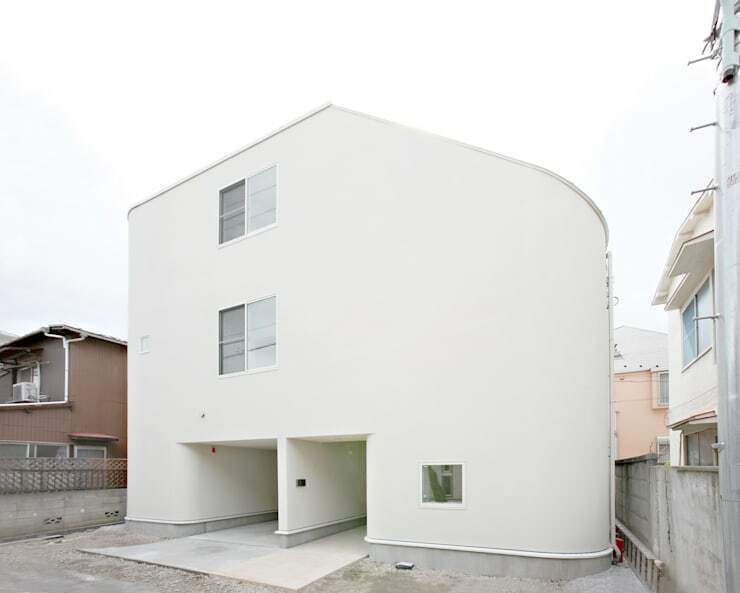 What did you think about this surprising Japanese family home? Tell us about it in the comments below!